1 A None No Power Seat 1 A has restricted legroom due to the position of the bulkhead. The proximity to the lavatory and galley may be bothersome. The tray table is in the armrest, making the armrest immovable and slightly reducing seat width. There is no floor storage for this set during take off and landing. 1 B None No Power Seat 1 B has restricted legroom due to the position of the bulkhead. The proximity to the lavatory and galley may be bothersome. The tray table is in the armrest, making the armrest immovable and slightly reducing seat width. There is no floor storage for this set during take off and landing. 1 C None No Power Seat 1 C has restricted legroom due to the position of the bulkhead. The proximity to the lavatory and galley may be bothersome. The tray table is in the armrest, making the armrest immovable and slightly reducing seat width. There is no floor storage for this set during take off and landing. 1 D None No Power Seat 1 D has restricted legroom due to the position of the bulkhead. The proximity to the lavatory and galley may be bothersome. The tray table is in the armrest, making the armrest immovable and slightly reducing seat width. There is no floor storage for this set during take off and landing. 10 A None No Power Seat 10 A is a Delta Comfort+ Bulkhead seat that has extra legroom as there is no bulkhead wall, just a curtain divider. The tray table is in the armrest, making the armrest immovable and slightly reducing seat width. 10 B None No Power Seat 10 B is a Delta Comfort+ Bulkhead seat that has extra legroom as there is no bulkhead wall, just a curtain divider. The tray table is in the armrest, making the armrest immovable and slightly reducing seat width. 10 C None No Power Seat 10 C is an Delta Comfort+ Bulkhead seat that has extra legroom as there is no Bulkhead wall, only a curtain divider. The tray table is in the armrest, making the armrest immovable and slightly reducing seat width. This seat juts out into the aisle and is often bumped by service carts or others passing by. 10 D None No Power Seat 10 D is a Delta Comfort+ Bulkhead seat that has extra legroom as there is no bulkhead wall, just a curtain divider. The tray table is in the armrest, making the armrest immovable and slightly reducing seat width. 10 E None No Power Seat 10 E is a Delta Comfort+ Bulkhead seat that has extra legroom as there is no bulkhead wall, just a curtain divider. The tray table is in the armrest, making the armrest immovable and slightly reducing seat width. 11 A None No Power Seat 11 A is a standard Delta Comfort+ seat. 11 B None No Power Seat 11 B is a standard Delta Comfort+ seat. 11 C None No Power Seat 11 C is a standard Delta Comfort+ seat. 11 D None No Power Seat 11 D is a standard Delta Comfort+ seat. The tray table is in the armrest, making the armrest immovable and slightly reducing the seat width. 11 E None No Power Seat 11 E is a standard Delta Comfort+ seat. The tray table is in the armrest, making the armrest immovable and slightly reducing the seat width. 12 A None No Power Seat 12 A is a standard Delta Comfort+ seat that has a misaligned window. 12 B None No Power Seat 12 B is a standard Delta Comfort+ seat. 12 C None No Power Seat 12 C is a standard Delta Comfort+ seat. 12 D None No Power Seat 12 D is a standard Delta Comfort+ seat. 12 E None No Power Seat 12 E is a standard Delta Comfort+ seat. 13 A None No Power Seat 13 A is a standard Delta Comfort+ seat. 13 B None No Power Seat 13 B is a standard Delta Comfort+ seat. 13 C None No Power Seat 13 C is a standard Delta Comfort+ seat. 13 D None No Power Seat 13 D is a standard Delta Comfort+ seat. 13 E None No Power Seat 13 E is a standard Delta Comfort+ seat. 14 A None No Power Seat 14 A is a standard Delta Comfort+ seat. 14 B None No Power Seat 14 B is a standard Delta Comfort+ seat. 14 C None No Power Seat 14 C is a standard Delta Comfort+ seat. 14 D None No Power Seat 14 D is a standard Delta Comfort+ seat. 14 E None No Power Seat 14 E is a standard Delta Comfort+ seat. 15 A None No Power Seat 15 A is a standard Economy Class seat. Delta designates this seat as a Preferred Seat, which is reserved for Delta Medallion members. This seat may be selected by Medallion members at time of booking or afterwards. This seat becomes available to all passengers at time of check-in. 15 D None No Power Seat 15 D is a standard Economy Class seat. Delta designates this seat as a Preferred Seat, which is reserved for Delta Medallion members. This seat may be selected by Medallion members at time of booking or afterwards. This seat becomes available to all passengers at time of check-in. 15 E None No Power Seat 15 E is a standard Economy Class seat. Delta designates this seat as a Preferred Seat, which is reserved for Delta Medallion members. This seat may be selected by Medallion members at time of booking or afterwards. This seat becomes available to all passengers at time of check-in. 16 A None No Power Seat 16 A is a standard Economy Class seat. Delta designates this seat as a Preferred Seat, which is reserved for Delta Medallion members. This seat may be selected by Medallion members at time of booking or afterwards. This seat becomes available to all passengers at time of check-in. 16 C None No Power Seat 16 C is a standard Economy Class seat. Delta designates this seat as a Preferred Seat, which is reserved for Delta Medallion members. This seat may be selected by Medallion members at time of booking or afterwards. This seat becomes available to all passengers at time of check-in. 16 D None No Power Seat 16 D is a standard Economy Class seat. Delta designates this seat as a Preferred Seat, which is reserved for Delta Medallion members. This seat may be selected by Medallion members at time of booking or afterwards. This seat becomes available to all passengers at time of check-in. 16 E None No Power Seat 16 E is a standard Economy Class seat. Delta designates this seat as a Preferred Seat, which is reserved for Delta Medallion members. This seat may be selected by Medallion members at time of booking or afterwards. This seat becomes available to all passengers at time of check-in. 17 A None No Power Seat 17 A is a standard Economy Class seat. Delta designates this seat as a Preferred Seat, which is reserved for Delta Medallion members. This seat may be selected by Medallion members at time of booking or afterwards. This seat becomes available to all passengers at time of check-in. 17 C None No Power Seat 17 C is a standard Economy Class seat. Delta designates this seat as a Preferred Seat, which is reserved for Delta Medallion members. This seat may be selected by Medallion members at time of booking or afterwards. This seat becomes available to all passengers at time of check-in. 17 D None No Power Seat 17 D is a standard Economy Class seat. Delta designates this seat as a Preferred Seat, which is reserved for Delta Medallion members. This seat may be selected by Medallion members at time of booking or afterwards. This seat becomes available to all passengers at time of check-in. 17 E None No Power Seat 17 E is a standard Economy Class seat. Delta designates this seat as a Preferred Seat, which is reserved for Delta Medallion members. This seat may be selected by Medallion members at time of booking or afterwards. This seat becomes available to all passengers at time of check-in. 18 A None No Power Seat 18 A is a standard Economy Class seat. Delta designates this seat as a Preferred Seat, which is reserved for Delta Medallion members. This seat may be selected by Medallion members at time of booking or afterwards. This seat becomes available to all passengers at time of check-in. 18 C None No Power Seat 18 C is a standard Economy Class seat. Delta designates this seat as a Preferred Seat, which is reserved for Delta Medallion members. This seat may be selected by Medallion members at time of booking or afterwards. This seat becomes available to all passengers at time of check-in. 18 D None No Power Seat 18 D is a standard Economy Class seat. Delta designates this seat as a Preferred Seat, which is reserved for Delta Medallion members. This seat may be selected by Medallion members at time of booking or afterwards. This seat becomes available to all passengers at time of check-in. 18 E None No Power Seat 18 E is a standard Economy Class seat. Delta designates this seat as a Preferred Seat, which is reserved for Delta Medallion members. This seat may be selected by Medallion members at time of booking or afterwards. This seat becomes available to all passengers at time of check-in. 19 D None No Power Seat 19 D is a standard Economy Class seat. Delta designates this seat as a Preferred Seat, which is reserved for Delta Medallion members. This seat may be selected by Medallion members at time of booking or afterwards. This seat becomes available to all passengers at time of check-in. 24 A None No Power Seat 24 A has extra legroom due to the exit row in front, however it also has limited recline due to the exit row in back. Delta designates this seat as a Preferred Seat, which is reserved for Delta Medallion members. This seat may be selected by Medallion members at time of booking or afterwards. This seat becomes available to all passengers at time of check-in. 24 B None No Power Seat 24 B has extra legroom due to the exit row in front, however it also has limited recline due to the exit row in back. Delta designates this seat as a Preferred Seat, which is reserved for Delta Medallion members. This seat may be selected by Medallion members at time of booking or afterwards. This seat becomes available to all passengers at time of check-in. 24 C None No Power Seat 24 C has extra legroom due to the exit row in front, however it also has limited recline due to the exit row in back. Delta designates this seat as a Preferred Seat, which is reserved for Delta Medallion members. This seat may be selected by Medallion members at time of booking or afterwards. This seat becomes available to all passengers at time of check-in. 24 D None No Power Seat 24 D has extra legroom due to the exit row in front, however it also has limited recline due to the exit row in back. Delta designates this seat as a Preferred Seat, which is reserved for Delta Medallion members. This seat may be selected by Medallion members at time of booking or afterwards. This seat becomes available to all passengers at time of check-in. 24 E None No Power Seat 24 E has extra legroom due to the exit row in front, however it also has limited recline due to the exit row in back. Delta designates this seat as a Preferred Seat, which is reserved for Delta Medallion members. This seat may be selected by Medallion members at time of booking or afterwards. This seat becomes available to all passengers at time of check-in. 25 A None No Power Seat 25 A is an Economy Class Exit Row seat that has extra legroom. This seat is missing a window-side armrest which may be bothersome. Delta designates this seat as a Preferred Seat, which is reserved for Delta Medallion members. This seat may be selected by Medallion members at time of booking or afterwards. This seat becomes available to all passengers at time of check-in. 25 B None No Power Seat 25 B is an Economy Class Exit Row seat that has extra legroom. Delta designates this seat as a Preferred Seat, which is reserved for Delta Medallion members. This seat may be selected by Medallion members at time of booking or afterwards. This seat becomes available to all passengers at time of check-in. 25 C None No Power Seat 25 C is an Economy Class Exit Row seat that has extra legroom. Delta designates this seat as a Preferred Seat, which is reserved for Delta Medallion members. This seat may be selected by Medallion members at time of booking or afterwards. This seat becomes available to all passengers at time of check-in. 25 D None No Power Seat 25 D is an Economy Class Exit Row seat that has extra legroom. Delta designates this seat as a Preferred Seat, which is reserved for Delta Medallion members. This seat may be selected by Medallion members at time of booking or afterwards. This seat becomes available to all passengers at time of check-in. 25 E None No Power Seat 25 E is an Economy Class Exit Row seat that has extra legroom. Delta designates this seat as a Preferred Seat, which is reserved for Delta Medallion members. This seat may be selected by Medallion members at time of booking or afterwards. This seat becomes available to all passengers at time of check-in. 31 A None No Power Seat 31 A has limited recline due to the exit row behind. 31 B None No Power Seat 31 B has limited recline due to the exit row behind. 31 C None No Power Seat 31 C has limited recline due to the exit row behind. 32 B None No Power Seat 32 B is an Economy Class that has extra legroom but is slightly narrower than other seats on the plane due to the crew seat in 32A. This seat has no underseat storage. Delta designates this seat as a Preferred Seat, which is reserved for Delta Medallion members. This seat may be selected by Medallion members at time of booking or afterwards. This seat becomes available to all passengers at time of check-in. 32 C None No Power Seat 32 C is an Economy Class that has extra legroom but is slightly narrower than other seats on the plane due to the crew seat in 32A. Delta designates this seat as a Preferred Seat, which is reserved for Delta Medallion members. This seat may be selected by Medallion members at time of booking or afterwards. This seat becomes available to all passengers at time of check-in. 33 A None No Power Seat 33 A has extra legroom due to a missing seat in front. Delta designates this seat as a Preferred Seat, which is reserved for Delta Medallion members. This seat may be selected by Medallion members at time of booking or afterwards. This seat becomes available to all passengers at time of check-in. 35 C None No Power Seat 35 C is a standard Economy Class seat. This seat juts out into the aisle and is often bumped by service carts or others passing by. 36 A None No Power Seat 36 A is in the last row of the plane and does not recline. The proximity to the lavatories may be bothersome. This seat is missing a window. 36 B None No Power Seat 36 B is in the last row of the plane and does not recline. The proximity to the lavatories may be bothersome. 36 D None No Power Seat 36 D is in the last row of the plane and has limited recline. The proximity to the lavatories may be bothersome. 36 E None No Power Seat 36 E is in the last row of the plane and has limited recline. The proximity to the lavatories may be bothersome. 4 C None No Power Seat 4 C is a standard First Class seat however, other flyers tend to bump into this seat. First Class seats have 110v AC power ports. Food service depends on route, length of flight, and time of day. A variety of complimentary light snacks are available in all classes. 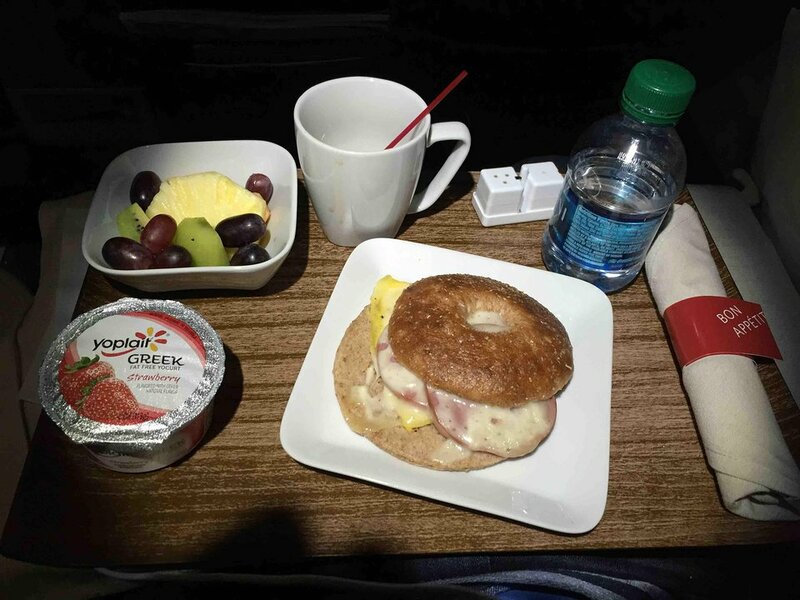 Premium meal service in First is available on most flights greater than 900 miles. Sandwiches, wraps, snack boxes and other items are available for purchase in Economy on flights greater than 900 miles. Non-alcoholic beverages are complimentary. Beer, wine, and a variety of spirits are complimentary in First and Delta Comfort+. They may be purchased in Economy. This version has recently been introduced and features an extra row of First Class and the mid-aft galley has been eliminated. The right-hand side of the aircraft features duo seats which may be more desirable for travelling couples. There is no video or audio and overhead storage is unlikely to accommodate large bags. Seat pitch is reduced towards the rear of the cabin. Due to rear mounted engines, the aircraft is noisiest towards the back and seats behind the rear exits should be avoided. I read all the comments before my flight, and this plane was in fine shape. Seat 20E was 17" wide at least, maybe 17.5. I'm 5' 10" and I had about 3" of knee space, no worries. "Loud plane?" Not from where I sat, it was actually one the quietest flights I've had recently! I sat in 29E on the return trip, DSM-ATL, and ditto, it was not overly loud at all. Surprised to be an MD-88. My first thought was, they are still flying these crates? As a small person I didn't feel cramped by the engine noise was extreme even with earbuds. Decent movie selection via the app. FA was solicitous in getting me hot tea with milk as there was only coffee and water served. Ridiculous boarding procedure. I was a "basic" fare and had to wait nearly 40 minutes to board. This seat has a short seatbelt. This is the smallest seat, with the least amount of legroom that I have ever flown on. The legroom was so cramped that I had to yank my carryon through the row just to get it to the seat. None of us in the row could use armrest because the seats are so narrow we needed the extra space. Horrible experience, I will avoid this aircraft at all costs going forward. This seat at the front was very comfortable and roomy! You are close to the galley and lavatory activity and can sometimes hear the auto-pilot call out to the pilots. I was not bothered by any of this but it could prove bothersome to other travelers. It's not just row 1, all first class seats have tray tables in the arms rather than on the seatback in front of you. As a person of some girth (5'10", 300 lbs), I was still able to use my tray comfortably, but YMMV. Inconsistent sizing on 2C's seat belt. Could not find any difference in jet version/generation, but flight from DAY to ATL, 2C's belt was a full 6 inches shorter than 2D, and I had to request an extender. For ATL to DAY, they were the same length. Unsure if this is due to previous belt damage, improper replacement, or what, but worth noting. When you pay for First Class to get more room and avoid the humiliation of asking for an extender, it stinks having to ask anyhow. Flew this seat from ATL to BWI. Plenty of space, although the space under the seat in front of me was lacking. Good legroom, AC power. Plane is getting a little long in the tooth, though the interior has been recently refitted. 13C does have power and plenty of legroom. The seatmap doesn't show power, but it definitely had it. Great Comfort Plus seat. Rows 10, 11,and 12 are extra-cost, extra-legroom. Rows 13 and 14 are extra-cost BUT NO extra-legroom. Nothing but argument from the Delta customer service representative. The on-board flight attendant said "MD88s dont have that many extra-legroom seats...most people buy these seats for the extra liquor." My flight was at 10AM. typical airplane seat. one caveat though - there is ac power, but i used it with my ipad mini 2 and it drained the battery. so keep that in mind if you have a similar device. that aside, its a pretty good comfort seat. id buy for sure. 26F is slightly narrower than an average seat. The seat has a full separation under the armrest, but more importantly the seatbealt is shorter which may cause an issue for customers of size. I bought comfort + and these seats are marked comfort + on chart. But the knee room is same as economy, and very tight. This one row is clearly mismarked as comfort + and I now have to take up getting a refund with delta corporate. The rest of the comfort+ seats have much more leg room. Luckily I took scaled pictures. DO NOT CHOOSE THIS ROW! Avoid this plane if possible. This is a VERY old plane with EXTREMELY noisy engines. Row 32 is right in front of the engine so a lot of noise/vibration. It seemed like the plane and my seat were shaking from the engine the whole flight. Flight was on tail number N692DL. Was in 26D and the arm rest for these seats was solid and could not be raised like the belonged to the exit row. Also the site says the seat pitch reduces toward the back of the plane however I had no issue with legroom (had some to spare even) in row 26 and 27 being 6' 3". On other MD88 flights i've been rows 16-18 and been more cramped. I plan on sitting toward the back more on future flights. Although 24A does not have full recline, the back of you seat is less likely to be kicked since 25A is also exit and has extra leg room. I find that in 25A my seat gets kicked or hit quite often by the person behind me. i am 6'2'' ,250# male. this seat was way too narrow. i had a 2 1/2 hr flight. I was glad the plane was not full. i was able to move. otherwise i would have had a very uncomfortable flight. This is a Comfort+ seat and the extra leg room was noticeable. I am 5'9" and slim. The middle seat was empty which was nice. The armrest does go up. There is no seatback monitor but there are power outlets between the seats in front of this row. The did serve free alcohol in our section even being a short flight from MCI to MSP. I would recommend any seat in this row. Engine completely obstructs view from window. This seat has extra legroom although it is narrower with a middle arm rest that cannot be raised (that is sometimes a great feature depending on who is in 32B). Tray is in the arm rest. I'm 6'3" and able to stretch out my legs nicely. The seat in front is a bit away so unless you are tall you'll have trouble reaching the seat pocket or underseat storage with the seat belt on. This seat has one of the tray table arm rests that is not moveable and therefore has reduced seat width. There's a rib that digs into your side the entire time-nowhere to put your right arm. Seatbelt is shorter than other Delta planes. Directly beside engine. Fumes before take off. Extremely noisy. This is a standard exit row seat with one twist: First, like most exit rows it has extra space and no recline. But, this seat also has no armrest next to the exit door, which could be a problem on flights over 2 hours, or if your looking to sleep, etc. Worst flight ever. I am 6 feet tall, 170 lbs. I fly 20-30 flights/year. I did NOT fit in this seat. The distance from the back of the seat to the tray table did not accommodate the length of my legs and I was forced to sit at an angle for 3 hours. Super uncomfortable. Again, worst plane ride ever. This is a Delta Comfort window seat& it was the most uncomfortable and small seat I have ever sat in. The arm rest does NOT go up, and there is a tray in the arm rest (or something...didn't pull it out) which makes the seat more narrow. The extra so-called leg room is barely noticeable. I would never book this class again. They need to have the arm rest go up for more room!!! My husband and I were totally squashed in. I paid $9 to upgrade to this seat which was shown on Delta's website as being a Delta Comfort Seat. When I got to my seat I realized this was not a Delta Comfort Seat. I hailed a stewardess and was moved to seat 14D. The regular seats on these planes are very cramped. My Delta flights that day on the MD-88 and the 717-200 had annoying engine fumes the whole way. Surprisingly pleasant aircraft and seat. Even though it is an old plane, noise was not too bad. A smooth flight and seat 27D offers ample legroom. (And I am 6' 3"). Window is aligned, so one can see enough (wing, and behind it). This seat doesn't recline, unless you consider 1/4 inch a recline. Its also very small. This is an old plane. No video. The water system is not working. Need to hurry up and get this junker back on the ground. This was a great seat. You got a view of the wing, you can recline. I'm 6'1 and can say the legroom was fine. Seat, 10/10. Loved it. The seat was comfortable. It did not have a window, which was annoying. It did, somewhat, recline. The only thing you can here is the engines. Best seat on the MD-88! Ample legroom, and a great view of the engine as well as the wing. 10/10 highly recommend. Flew on this old bird from MSP-ABQ. The aircraft is old inside. Lets make that clear. The seats are old as well as the bins and other fittings. Bins were very small and the leg room was tight. I would only recommend flying this plan if you are an aviation geek and love old planes. If you're just an average traveler you will be much happier on a 737 or A320. Horrible seat. I am a small woman and felt cramped sitting next to an average size adult man. I am 5'5" and my knees were less than 2 inches from the back of the seat i front of me. The view from the window was of the engine and the noise was awful. As if all of this wasnt enough, I has the pleasure of sitting in front of 2 ill behaved children who kicked my seat while the parent read a book with earbuds in his ears. The regular economy seats have noticeable below average legroom. Be aware if you're tall/large. The under seat space for your feet/bags is also pitiful. this plane has the engine right next to the seat 34 to 36. So, it is so loud and not comfortable to seat in these seats. Do NOT recommend! Windows are not spaced well for this seat - you aren't leaning into the window, but into the space between windows, which cuts off at least 2" of elbow room. Grr... i hate seats like this. Great seats!! Was very surprised that these older planes have the most comfortable seats!! Would recommend flying on delta's md 80's for sure. Not bad, window lovers rejoice for you can lay claim to two windows! One at shoulder provides a little extra room, one beside 19E seatback provides best view without too much strain on neck. And not awful legroom either, slim 6'4" with knees just off the forward seatback. Two-up seating on this side. Decent seat, better than average recline. Only problem is that there is a bulkhead in the ceiling that prevents the doors to the overhead bins for rows 25 and 26 from opening completely on either side of the plane; this makes it impossible to load larger carryons. Had to stick mine over 28 which made for a tricky exit upon deplaning. This seat was the best Premium Economy seat I've ever sat in. I was able to fully extend my legs and still have a couple inches to spare. The only complaints I have are that the tray table was a little difficult to open, and the amount of legroom made it harder to reach your personal items. Otherwise, an A+ seat! Seat 11D. This is a very narrow seat due to the tray table in the armrest. I could not fit my pelvic bone crests into this seat and sat sideways from MEM to ATL. 32B Narrowest seat of my life. If it wasn't for the courtesy of the guy in 32A to put up our mutual arm rest, I surely would have had bruses on my hips. Flip flops fit i. The sliver of storage in front of you, but it is out of arms reach. Good seat if you don't care about recline (I don't). I'm 6'2" and had plenty of legroom, especially since the row ahead doesn't recline. You also get two windows. The center arm rest was immovable and two inches thick, which narrowed the seat width uncomfortably for me. Worst seat ever, right next to engine, excruciating noise. I forgot to mention in my previous review. As with other reviews, the engines on this plane are very loud. Even at row 31, they were kind of a nuisance. If engine noise is bothersome for you, I would recommend a seat toward the front of the plane. Great Window seat. However, due to the way the rows are aligned on this plane, this particular seat allows you access to two windows, which is a plus for window seat lovers. This seat is the sweet spot; why it has mixed reviews I have no idea. Same width as other seats, and the arm rests are not fixed like other ER seats. I would take this seat over 33A, as 33A is hugging the curve of the wall and the Emergency Exit door cramps in on your space - as well as the flight attendant when they are seated directly in front of you on a jump seat, facing you. Comfort+ is good on your backside and could be tolerated for many hours, width isnt great but sufficient, economy seats on delta are like wood, no padding. It would be revolutionarty of Delta to adopt the comfort+ seat to standard economy. The alcohol, its included in comfort+, they only had one mixed drink available from the menu but was decent. Is the upgrade worth it at $30 over economy? yes. The aisle armrests do not move. Overhead bins do not open all the way because the life raft is in the way of most of the seats in economy comfort. Beware of engine noise. This seat, and ones near it, are very close to the engine and the noise at takeoff is deafening. Be prepared with some form of hearing protection. More leg room than Delta's 757-200, but the arm rests were lacking - thin, hard, immovable, and really only one in the center of D and E. Row is on the wing, so the view is obscured (if you care), but it's a very quiet ride other than the occasional adjustment of flaps. This plane didn't have charging stations/plugs or any TVs/screens mounted, but the interior was in good shape and didn't appear aging - just not upgraded. I sat in this from Dallas Tx to Atlanta Ga. I was very comfortable. I'm overweight and usually struggle to buckle my seatbelt, but I had extra room on the buckle in this seat. I'm 5'4 so I had plenty of room for my legs and my stuff was easy to get to under the seat in front. Takes longer to get off because its in the back, but I would sit here again. 1" room between kneecap and seat infront of me. under seat storage shallow so even small backpack juts out into the floor area beneath feet. These "premimum seats" 10-14 are barely if anything anything more than regular seats, too much money for nothing. Delta should be ashamed of this ripoff, so typical these days. I am 6' tall and have both knees replaced. Sitting with my rear pushed all the way back against the seatback, my knees still touched the seat in front. I wish I'd brought a measuring tape. I'm sure the seat pitch was less than the advertized miminum of 31". When the passengers in front jostled or moved, the seat dug painfully into my metal knees. I was miserable! Under no circumstances are you to sit in these seats. They're cramped, loud., smell, and have zero recline. The legroom amount I'm sure is smaller than the regular seats and at my 1.8m (5' 11") stature I was rubbing my knees against the metal arms. The engine roar is deafening, especially when reverse thrust is engaged on landing. Though there'd be nothing to see, the lack of a window can add to airsickness and nausea. You are, frankly, sitting where a closet or storage might be and that makes me very sad to think about. If given the option to fly in these seats or walk to your destination, pick the latter. Maybe I was spoiled because on my outbound flight I flew in a Boeing 717-200 and the Comfort Section was CLEARLY roomier and more outfitted than the Coach section. But I didn't find this seat to be any better than the Coach seats three rows back, AND there was no AC outlet which was a bit frustrating. Tight fit and my bag, which fits EVERYWHERE - didn't fit in the overhead compartment and couldn't fit in its entirety under the seat in front of me. I had to straddle my bag the whole flight. It wasn't a bad experience, per se, just not the WONDERFUL experience I had on my outbound flight. Not a bad experience, just not the FANTASTIC experience I had in the Comfort Section on my outbound flight which was on a Boeing 717-200. These Comfort seats didn't seem to be much different from the Coach seats three rows back and had no electrical outlets, which was a bit frustrating. Also, the overhead compartments were smaller. I have a rollie that fits everywhere, but it wouldn't fit in the overhead, or even completely under the seat in front of me. Much less space than expected. Slightly larger seat as it was first class. Our side had the larger over head bins due to the 3 seat configuration on our side. Able to fit our roller case in. I am 6' and broad shouldered. I flew in 16E and 17A recently. Both seats have the same issues. First is the pitch. My knees were wedged against the seat in front. I've lived with this before on other airlines, but something peculiar about the Delta seats. Due to the narrow width of the seats, one knee was wedged against the seat frame and/or the metal spring for the magazine pouch. This was extremely unpleasant. Regarding width, I was in a window seat both ways and I could not sit up vertically due to the outside wall of the hull and the narrow seats. I had to twist slightly to avoid pressing too much in to the person next to me. I will avoid this air frame all together in the future. Worst seat ever. People are constantly in the bathrooms opening and closing the doors, Not to mention the unbearable noise of the engines. There are also no windows and there is so much vibration from the engines.I highly discourage you to sit in this seat unless you absolutely have to. In my case I booked very late and got assigned at the gate so i couldnt help it. The only good thing about this seat is that there is no seat next to you. sat in this seat on the MD88 LGA-MIA. Had good legroom for me (6ft tall) but strange thing is armrest was not moveable and tray table was both on seatback in front of me and in armrest - which was unusual since not an emergency exit row or bulkhead. Reduced seat width was noticeable. Rows 35 and 36 of Delta MD-88 aircraft have their windows blocked by the engines; the same is already noted for American Airlines MD-80 aircraft. Row 25 (exit) is the best row in economy on this aircraft. The legroom is better than 1st class. For those who remember the DC-9's, once the workhorse of the Delta and Eastern fleets, this craft is very similar. Overall I agree with others. My seat looked to have been recently installed and was fine for a short-hop flight. Service acceptable for FC and no traffic from Coach area was allowed unless an emergency. But for a long haul flight, it would become uncomfortable. Seat 33A tray table is located in the right armrest. Seat is still plenty wide to accommodate larger fliers but limits the ability to spread out. Newly refurbished seat which is comfortable. When the seat a head is reclined to its maxed position, it is difficult to get out of your seat to reach the aisle. 4C is a very comfortable seat. People do bump the seat when passing but, not everyone is aware of the luggage. Lots of leg room.The overhead compartment are larger on Right side. there is no seat in front, so personal items must be stowed above for take off and landing. However, a small pocket for reading material is to the left of the seat. I need to defend seat 11D! I got seated in 11D because seating was not assigned until we got to the gate. I had read the awful reviews here, but the only other option was 33C, and I didn't want to smell the lavatories. As it turned out, it was roomier in terms of both leg room and width than the standard economy seats. Also, the people who get to select these seats are in a special class that is below first class, but above standard economy. They get free alcoholic beverages with these seats, which is a new rule that began March 1st, 2015. I don't use alcohol, but I could have gotten a free drink as well, just for being in the seat! By the way I am overweight, and I was able to fasten my seatbelt in 11D without an extender. Back in 22C, I had to use an extender, because the regular seatbelt only went 75% around "me belly." Back in 22C, elbows were always an issue. In 11D, my seat mates must not have had elbows, because I never got poked once. Delta's MD-88 are very comfortable. I travelled from LGA to MIA and the trip was very enjoyable. Note: try to choose a seat in front of the wing emergency exits, as the engine noise gets louder the further back you go! I sat in row 36 on seat B and there was no window, no recline, engine noise is unbearable, and you sit about a foot away from the bathroom. I don't really like the MD-88 very much due to some much needed improvements. Interior seemed newly refreshed with crisp LED-based lights. Legroom was very tight, pitch must be less than the 33-31 inches stated, I would guess 29-30, but the seats are not the ergo-slimline that make better use of space. At 6'1, my knees pressed on the back of the seat in front and the tray table rested on my legs. When the passenger in front tried to recline, he could not, it was blocked painfully by my knees; the seat was empty next to me, so I could sit askew into the other seat and passenger could recline.. But if the seat had not been empty, it could have become contentious - there would have been no where for me to move my legs. One other comment for the first class seats is to be sure and try to book in row 2 or 3. The overhead space is very limited for rows 1 due to emergency equipment. Also no video on this aircraft type, but you can use onboard internet for viewing movies and TV shows and you don't have to pay for the GOGO inflight wifi, just use the Delta entertainment app. This is a dreadful seat with smaller seat width and immovable armrest. Upon measuring the leg space, even the flight attendant agreed that the leg room was the same as regular economy seats. Paying extra for this seat and the one next to it is a ripoff by Delta. The attendant suggested that I contact the airline. Seat 10A on the MD88 is not a comfortable seat. I was in this seat for the 1st of a 2 leg trip on the same aircraft. The first row of economy comfort seats sit between the protruding ribs of the aircraft paneling. What I experienced was the rib protruding into my shoulder. Since the armrests were immovable, the seat width was unacceptable since I was more or less unable to sit straight up. For the 2nd leg of my flight, I had a standard economy seat in row 17 which was way more comfortable, also a window seat! Terrible location. Turbine engine completely blocks window view, noise from turbine is over 95dB. I sat in this seat on an MD-88, and while the legroom is amazing, the seat is right next to the engine. The noise on takeoff is extremely loud. I would add that to your description. Fairly comfy. 5'10" and I had good leg room. Nothing bad but the seats are a bit narrow for those of us with broad shoulders. This seat has great legroom, but there is a little bit of a chill because of the emergency exit door. The armrest between 11D and 11E cannot be raised. This makes the seat width narrower. They must have fixed this seat at some point because it's hard as a rock. Good thing it's only a short flight but it pinched my nerves and cut off feeling to my left leg. Worst delta seat I've ever flown in. This was an awful first class seat. The plane's interior was newly updated. No less than 5 times did the flight attendants and other passengers squeeze in the small space in front of me to let someone pass by. My arm was often bumped as anyone passed by.The table tray was in the arm and did not slide forward enough. (I thought I must be big until I looked at the tiny person in 1D who had the same problem.) The pocket that hangs on the bulkhead in front of you is so small and tight that it's worthless. I made the mistake of putting my phone in there while I ate (no space elsewhere) and struggled foolishly to get it out. Not worth paying for this seat. Standard economy seat. Noise of the engine is still pretty loud up hear. You want to pick a seat in the front section of the economy cabine. These seats cost extra as they're sold as prefeered seating. Okay seat, on an old plane. I thought I was going to hate it, but it was a more fun ride instead of a larger plane. I wish they had entertainment! Worst seat I've ever sit in on a Delta Flight. It was more like Economy Discomfort. The seat has got to be thinner than usual already and then has a tray in the armrest and seatback. 10D/E & 11D/E are terrible if you care about seat width at all. I thought there might be a mistake when Seatguru reported the tray tables in the armrests as there is a tray on the seat back in front of this seat (and 11E) but indeed there is a tray in the armrest making the seat slightly narrower. A better choice might be 12 D or E as they have no tray in the armrest. Still offers more legroom than standard economy. This is a HORRIBLE seat. This should not be called a standard seat. The view out of the window is completely obstructed by the jet engine, which appears to be about 5 inches outside of the window, meaning not only will takeoff and landing make you partly deaf, your bones will be seriously rattling during both. And if you are claustrophobic, you will not enjoy the view! I've flown many bulkhead 1st class seats & this is one of the tightest one I've been, I would not recommend at all. Could barely put my feet up. Delta flies 1 versions of McDon. Doug. MD-88.